p|m Gallery is tucked into a bright stretch of Dundas West , between a Portuguese cafĂŠ and Henhouse (a bar), a few doors down. 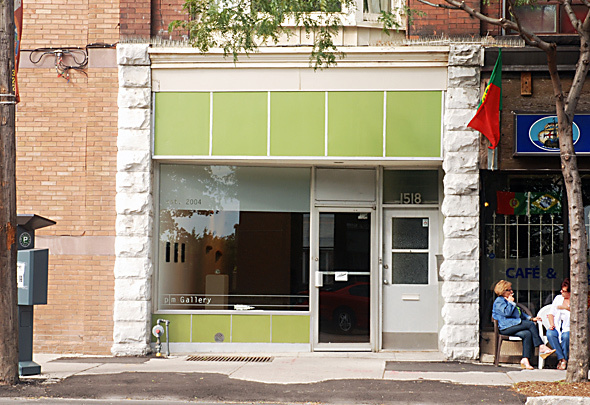 I stopped by the other day to chat with gallery owner Powell MacDougall, after whom the gallery is named. Like many galleries in the neighbourhood, p|m is on the small and narrow side. It's wall space is comprised of three main stretches, one of which is nestled under a staircase, forming a cozy, yet wide, alcove. The space is bright, smells of fresh paint, and features a snazzy bamboo floor, and a window at the back of the gallery, overlooking a cement patio. Although p|m Gallery is a newcomer to Dundas West, Powell herself isn't. During her former job as the assistant director at Christopher Cutts Gallery near Roncesvalles, she used to pass by a vacant, yet charming hole-in-the-wall on her streetcar trips between work and her east-end home. 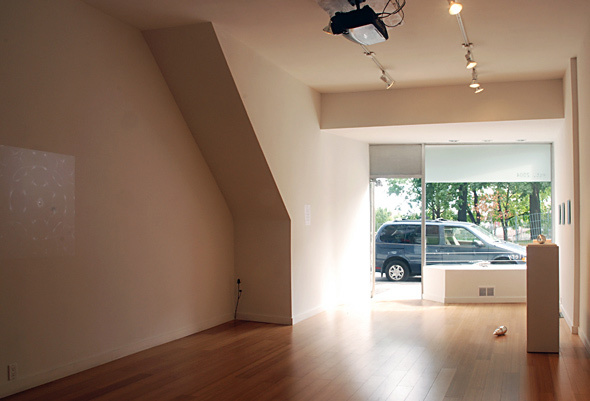 Striking out on her own, she opened p|m Gallery in 2004, in Leslieville . But, after a few years, p|m wasn't getting the foot traffic she'd hoped for, and she followed in the footsteps of fellow gallerists Wil Kucey of LE Gallery , the Loop Collective, and Jessica Bradley, in moving to the Dundas West area. She initially planned to stay close to Ossington, but on finding that quaint, cozy space at 1518 Dundas (that she'd passed by so many times) was not only still vacant, but for rent, p|m made the move in January 2010. Powell describes the location as the "sweet spot" between the hipster strip of Dundas at Ossington, and the higher-end enclave on Morrow, the territory of veteran galleries Olga Korper and the aforementioned Christopher Cutts. On the roster at p|m are 14 artists with wildly divergent practices. Media from painting and sculpture, to video, sound installation, and even performance art, are represented. Powell admits it seems scattered, but she chooses artists who have, in her words, "tongue-in-cheek humour or social poignancy," in their work. 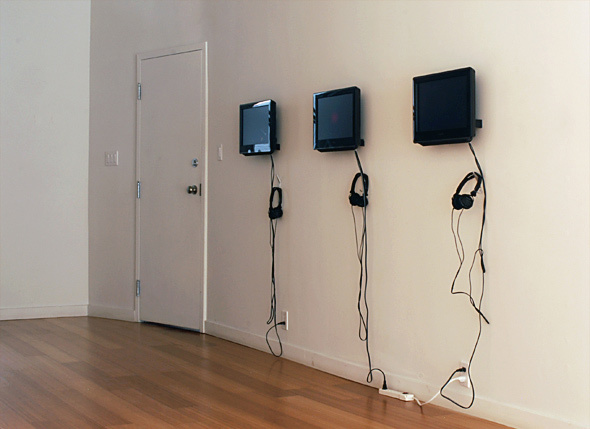 Currently on view is "Babble," an exhibition of sound-related work in various media by Duncan MacDonald. The eclectic group of objects reflects p|m's wide-ranging vision (although the humour and poignancy of these objects is lost on me). The gallery also prefers to represent painters who push the medium's boundaries in unconventional directions. To illustrate her point, Powell and I descended to the storage room, where she shows me some work by Meghan McKnight, William Griffiths, and Amanda Reeves-- three painters who all create abstract works via unconventional methods. The paintings of Griffiths in particular piqued my interest: to push his painting practice, he manipulates the paint with heat, chemicals, and other science experiments to change how the paint behaves on the canvas. It's worth noting that the works are priced to garner a respectable sum-- the smallish works for sale by Duncan MacDonald were $650, and larger works by the aforementioned painters ranged from about $1500-$4500. So after seeing these colourful, engaging works, I was a bit underwhelmed when I returned to the main floor and looked again at the exhibition. Duncan MacDonald's wooden and aluminum sculptures, videos on monitors, abstract photographs on aluminum, and one projected video, claimed to be "showcasing sound in visual formats," but I thought it was explored in too many different ways to hold my interest. Also, the space wasn't appropriate for projecting a video, with the sun streaming in the front window and nothing to shade the wall where the work should have been visible. A dark curtain or other barrier probably would do the trick. 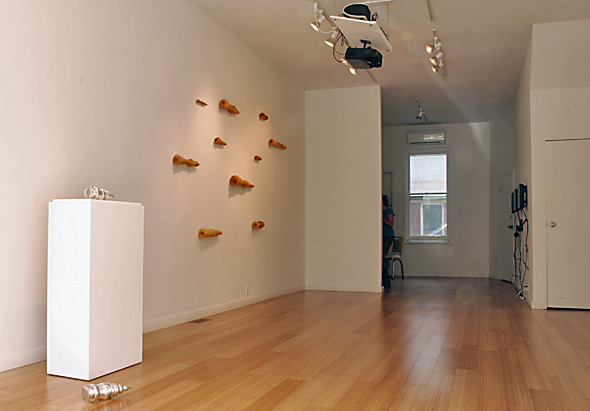 Overall, p|m Gallery is a small, unassuming space that packs a punch. Its roster is surprisingly conceptual, but Powell is determined to help her artists gain a wide audience. She also told me about her ideas for a sculpture garden at the back of the building, and round-the-clock window projections at the front. I hope these plans come to fruition, as they would add a little excitement to a promising gallery. All in all, visiting p|m Gallery was a stimulating experience, and I left feeling excited to see what's in store for the future.